ICE-The Irish Concertina Ensemble brings together five internationally renowned and leading exponents of the Anglo Concertina. Conceived of and directed by Tim Collins, ICE creates a new sonic template for Irish Traditional music. Situating it within this quintet format pioneers an exciting and innovative performance trajectory for the concertina, where its melodic, percussive, rhythmic and harmonic boundaries can be explored and redefined. 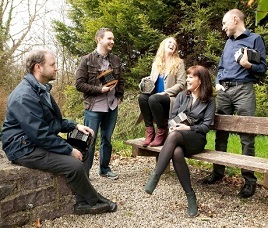 The quintet's debut recording Zero was released in 2015 and comprises a highly interesting and experimentally-arranged repertoire of music that not only draws on established melodies within the canon of Irish Traditional music, but also on material from other traditions as well as newly composed material written specifically for the ensemble.